If you're hungry for our famous mouthwatering sushi or want to try the adventure of our hibachi tables the knowledgeable staff at Nakashima is ready and eager to serve you. Nakashima of Japan offers both Hibachi and Sushi Dining. 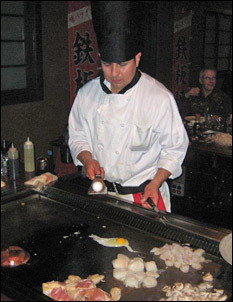 Hibachi is where our chef prepares your dinner in front of you while flipping salt and pepper shakers, spatulas, forks, or whatever else he finds … maybe even your food! The food tastes as great as their show looks. We take the freshest fish or vegetable, wrap it in vinegar rice and roasted seaweed for a taste that is simple satori (enlightenment). We try to keep the heritage of Japan alive in our dishes as well as appeal to our American customers. We have rolls the Japanese have been making for centuries such as the Negihamachi Maki and the Tekka Maki. We also have some that never left the borders of the dairy state. Our Red Dragon Roll and Nakashima Roll we invented right here. So come and travel to Japan using nothing but your taste buds. Ask about allergies at your table! Nakashima's has been a birthday tradition for many years in our family and has always proven to be a consistently a good experience, that is until this February 18th. It was my birthday and as we always do in our family we went to Nakashima's for dinner. It was a Saturday so they were especially busy. We arrived around 7pm and were told it would be an hour and a half. We did not mind the wait, as we do not see each other that often as we have grown older and would use the time to catch up with each other. It was a little after 9 when were seated. We were the second last table to be seated. We were seated with a young family, 4 children and two adults. Since there were three of us, all adults, it made for a pretty tight squeeze. Right from the start something was different. Nothing was happening as it typically does. When I got my steak and mushrooms before any thing else, I asked our chef what was going on. I didn't get an answer so I told him I wanted the fried rice I ordered which always comes before the entree. I was told I would get it at the end. Hearing this I went to see the manager on duty to ask why. All very calm I might add. I was told there was a food allergy at our table. Turns out someone was allergic to onions. It also seems there is onions in almost everything they make there. So when I got back to the table, upset at this point, and explained why we did not get the meal we ordered, I must have gotten a little loud. We could not help but wonder why that persons meal had not been prepared in the back kitchen or why we were not seated with the last table which only had two people and was seated immediately after us, not that we would have minded waiting a little longer since we had already waited over two hours. The mother of the children told me I was scaring here children. (Oh, did I mention the woman was wearing pajama pants. I don't think I could say anymore about the type of people they were than that.) I wasn't that loud, then her boyfriend decided to enter the conversation with an attitude so things went down hill from there. There were a lot of things management could have done to assure we got the meal we ordered. They really dropped the ball and it became a much larger problem than it needed to be. I was skeptical going here at first. I didn't know if I'd like the food, experience, etc. I must say that I walked away impressed. The food was pretty good and it was something different than the ordinary dinner. We started in the bar area which is very dimly lit and kind of contemporary. Kind of had a clubby feel to a certain extent. Drink prices were average, not cheap but not totally expensive. We then moved to our dining area. We had a group of 4 and there were 4 others that sat around the grill. Dinner prices ranged from $20 to $40/person. The experience is largely based on the cook you get. We had a nice guy and did a pretty good job, I saw others that looked pretty skilled and had more presentation. The food was pretty good and all cooked up in front of you. And you get small portions throughout. Service was friendly but it was really slow getting drinks and our bills ended up getting charged to wrong cards. This was probably the only negative. I would definitely recommend and go back. To me to seems better in a group than just a couple, and probably would go a few times a year at most. But the food was good and experience was pretty cool. This is a fun place for the whole family ! The bar area is unique and cozy.....with great decor and a giant squid above your head ! 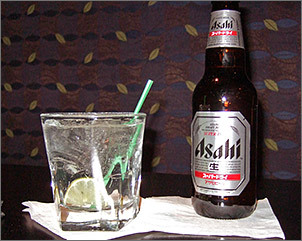 There is a wide range of available drinks.....both American and Asian. Kids love the Japanese bubble gum soda with a marble stuck in the bottle neck ! I am told by my family this is the best shrimp in town.......but I don't think I'll ever know since I always order the filet mignon....which is simply fabulous. Portions are large, and of course the juggling and expertise of the hibachi chefs is always amusing.....and they pay special attention to amuse any kids present. 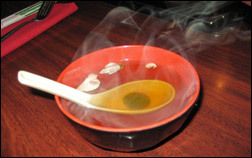 Hibachi dinners include soup, salad, tea, appetizer, meal and dessert. 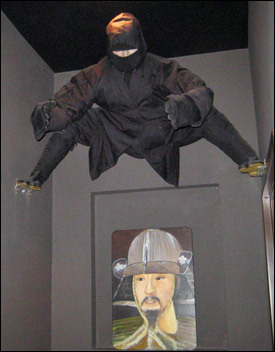 The lifesize ninja statues are cool, and the staff seems to enjoy themselves. Nakashimas is a place we go for a special occasion, as the whole experience is great. This is certainly an interesting restaurant with its decor. Particularly in the lounge area your eyes won't be bored. It's very dark and there's a giant squid or octopus hanging from the ceiling plus large murals on the walls. They have large booths that are very private and they serve a couple of Japanese beers and sakes. The sushi is only so-so (I tried tuna and eel rolls) but the hibachi is very good (the angus filet is delicious and tender). I had a friend visiting from out of town and we decided to try this place because we were looking for a unique dining option. This place seems like a pretty well run restaurant. 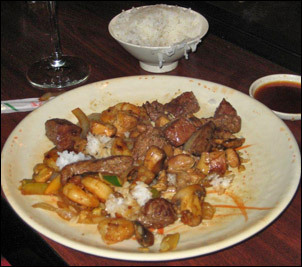 The food is good (what you expect from a Japanese steakhouse), and the portions are generous. The service is efficient and the place definitely has a unique style. We only tried the hibachi and not the sushi, but I thought the quality of hibachi food was better than some other places I have tried in the past. 4 stars because our chef wasn't the most pleasant and our waiter, although efficient, was not friendly. What a great place to eat or to hang out with either just adults or with the whole family. The lounge here is very inviting with great decor. The food is always excellent and there is something for all taste buds. The sushi is worth its value as is the hibachi. I would definitely recommend! Martinis, Beer, and Wine. We have it all the time! Nakashima’s atmosphere and décor has a Japanese flair and smooth clean lines. Hanging on the walls are colorful painted pictures of Japanese woman of long ago and in the background soft soothing Asian flute music plays. Each of the hostesses wears a kimono which adds to the charm and ambience of the restaurant. The hostess stand is in the middle of the restaurant with a huge bar lounge room on the left and the sushi and hibachi dining rooms on the right. Upon entering I was asked if I would be eating sushi or if I was there for the hibachi style of dining. I chose the hibachi style of dining. I was then seated at one of the hibachi dining tables, each of which seats eight people and has a massive grill that is directly in front of the diners. In the hibachi dining room adorning the walls are replicas of different ancient warrior masks with lit up eyes and long cloth scrolls with Japanese writing. After being seated a server came to take our orders, I ordered one of the combination hibachi dinners. It was $24.95 and included a house salad, Japanese clear soup, flaming shrimp appetizer, vegetable appetizer, white rice, shrimp, filet mignon and finished off with oolong tea, vanilla ice cream, or sherbet. The salad was brought out first. It was a small freshly chilled iceberg lettuce salad with the dressing on top. The dressing had a pungent fresh ginger flavor and was very pleasing. Next our soup was brought out to us. It was a clear chicken and beef broth soup which had a salty good flavor. Then the hibachi chef arrived at the table. He was dressed in white with a tall chef’s hat and wearing his sharp knives on a belt around his hips. He rolled a cart which contained all the fresh ingredients, supplies and condiments for preparing everyone’s meal. He bowed and greeted everyone with a smile and then asked everyone at the table about their order and how they would like their steak done for those who ordered it. Then the fun and entertainment began. All the entrees and appetizers were cooked with lightning speed, precision and flair. He did fun tricks like flipping the shrimp tails into the top of his tall hat. He got the diners involved in the fun by flipping shrimp tails in their water glasses or quickly refilling a water glass artistically with a plastic squirt bottle. He also made explosively high flames on the grill and played out a drum tune with his wooden salt and pepper shakers. Using sliced onions he dramatically created a steaming volcano with flames that resembled lava. The entire meal was great fun and very entertaining. After the soup arrived, the grilled shrimp appetizer was served it had a good sweet fresh flavor. Next the chef served the vegetable which was thinly sliced zucchini with fresh bean sprouts. We were also served a small side bowl of white rice. The chef then proceeded to individually grill the meat and seafood and slid a portion off of his large metal spatula to the person who ordered that particular food. After the entire meal was finished the chef politely bowed and said good bye. Our server then cleared the plates away and took our ice cream orders. I truly had a delightful dinner and must go back soon to try some of their scrumptious looking sushi. It was a girl's night out. But with five girls you have at least three different places they want to go to. I know even three places is a bit adventurous for us, seeing how once we get settled with a drink, good atmosphere and plenty of gossip to go around, we don't move. I know this. And they SHOULD know this. Anyway. The plan was to start out at Nakashima's. Well, we did start out there and we also ended it there too. Nakashima's is anything but a quick stop for a little bubbly with a kick. When you walk in you're greeted with the host stand. To the right is the dining room with the hibachi tables and to the left are the bar and the lounge. I'm sure the food is awesome but that was the furthest thing from our minds. I'll have to come back to get my sushi and hibachi on. We made our way to the bar and lounge room and normally I like to sit at the bar but with this gaggle of girls a table was a must. The bar is quite big and it has plenty of hi top stools around it. There are also booths lining the walls for you and your entourage to relax in. Once we got settled the bartender came over and checked our ID's (we love him btw) and took our drink order. One of the girls likes different imports and was pleased to see that Nakashima's has a couple of choices for Japanese beers as well as imported sake. She settled on an the beer, Asahi, which costs $4. And the rest of the girls got Vodka sodas and Rum n' cokes. Those drinks set us back $3.50 apiece and let's just say they are not stingy with their pours (after that, we REALLY loved him). I have also heard thru the grapevine that this place makes a mean martini and can whip up a fruity blended cocktail that would even make your liver say, "yum." For a Monday night, the place had a crowd. But nothing crazy, so it was perfect for my girlfriends and me, we just wanted some drinks and chit chat. On Thursdays and Fridays they have live music. Call them up or check out our event calendar to see who's playing. The decor in Nakashima's is pretty cool to look at. They have all the required Feng Shui things a Japanese restaurant would have but you can tell that they also added their own flair. 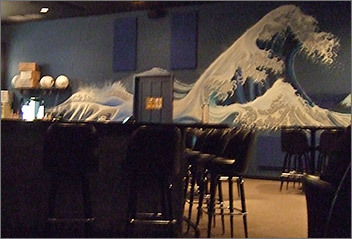 Check out the tidal wave mural on one of the bar walls or the gigantic squid hanging from the ceiling in the middle of the room. Pretty cool. That's exactly what I have to say about Nakashima's, pretty cool. The drinks – cool, the atmosphere – cool, the bartender – way cool. Cool, cool, cool all around.